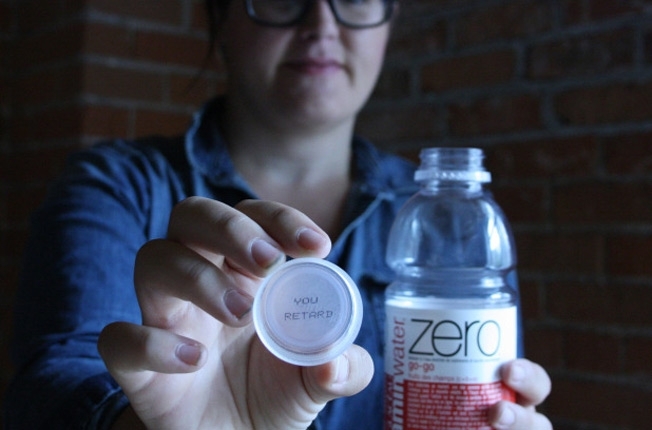 Coca-Cola is in a bit of hot water over a bilingual promotion in Canada which resulted in "You Retard" being printed on Vitaminwater bottle caps. The bottle cap was found by Blake Loates whose sister, Fiona, has cerebral palsy. Fiona's father, Doug Loates was angered and wrote a scathing letter to Coke. In the letter, Loates wrote in part,"The R-word is considered a swear word in our family. What would YOU do if you opened up your bottle of Vitamin Water and on the bottom of the lid it read, 'YOU RETARD? I bet you'd be pissed if you had a Fiona in your life! ... Can you imagine if SHE [Fiona] had opened this bottle???" Coke responded by pausing the promotion, explaining that the words were reviewed from the perspective of French speakers and issued a brief statement saying,"We did not mean to offend at all. We are certainly very apologetic for this oversight." Apparently the word was used because in French "retard" means "late." Coke is drafting a formal apology to the Loates family. The letter Doug Loates is below.